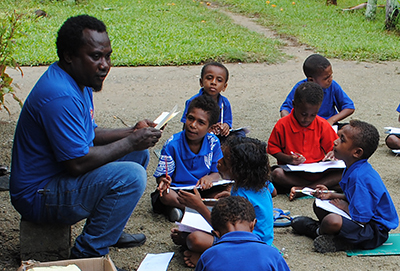 Home › Home News › Read Valentine’s letter from PNG! Read Valentine’s letter from PNG! Valentine Masa works in the remote township of Vanimo, Papua New Guinea. This is a community where many Sisters of St Joseph served with the local villagers from the 1960’s for many years and are fondly remember by so many. Read all about Valentine’s life and work with Callan Vanimo Special Resource Centre, a partner of MMI’s, for both our Inclusive Communities and Early Learning Programs. Meet Willie, an inspirational volunteer!